The Only Time I saw the Undertones I believe was 1979, Harley Flanagan (who was only 12 years old and drumming in The Stimulators at the time), Rob Dellenback, and myself were standing outside Irving Plaza in New York trying to weasel our way in on a guest list or sneak in the back door somehow, but we were having no luck. Con una qualcerta nonchalance riesce a non farti pesare il fatto che è decisamente più fico di chiunque altro, perchè oltre ad essere un signor fotografo, lui si è anche visto gli Undertones nel 79, all'Irving Plaza, insieme a Harley Flanagan e Rob Dellenback. Oltre a raccontare del concerto linka anche un documentario sul gruppo curato da John Peel (che li adorava), che vale la pena di guardarsi. 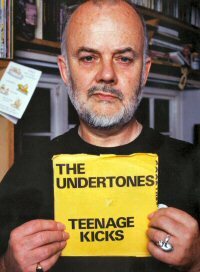 John Peel vi consiglia della buona musica.